Since the Plastic Surgery tickets we got were tradeable, the broker is full of them. The prices aren't expensive either. I'd recommend buying one from the broker. my mains are sorc and cleric and i got popoku and tarha so this event is not on my side. I am really dissapointed and angry at the same time beacose random crap that GF applyes on every single event speaks again and this time people are left behind and this time it affects people big time. Its exacly like in the childhood when u were expecting christmas day for santa wishing for a nice car and u get a frikin doll. So support replyed and they restored the box in my inventory , great job like always when I had a problem. where = adverb, were = verb. Sorry for the offtopic but I couldn't help it. The post was edited 1 time, last by iSTAN ( Feb 7th 2019, 8:41pm ). My pocket cleric in const party fused x4 golds(event rewards) and got Hamerun. I also wanted to switch character's gender, but checked database b4 doing that. Refilling Gender Switch Ticket (1 day) that's the box with infinite tickets. Another week past another 30 x opened again 0 ancient. 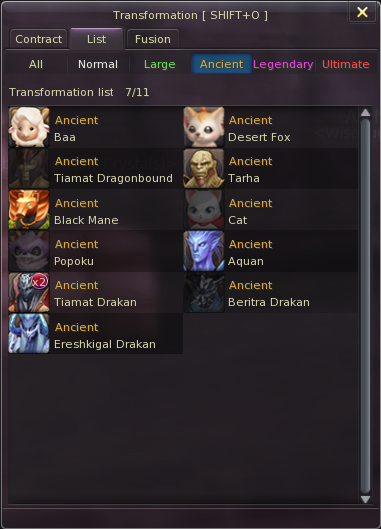 Ive also opened about fifty and I got like six ancient afterwards. 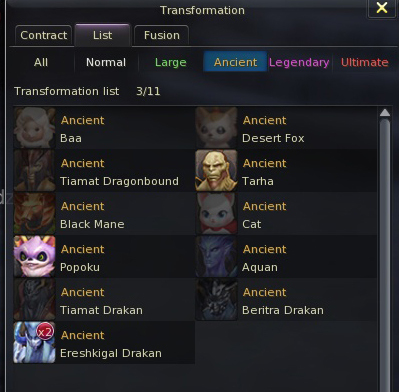 The trick for me was to use my old laptop that can barely handle aion so even the loading of the contract was some what slow. I guess the fps lag conyributed to the chances. I might be late but I'd really advice to keep form scrolls until 6.5. Pretty much all Transformation Collections require new 6.5 added forms to be completed. Who cares. Its better now to open them for duplicates and chance for legendary transform than even think about those colections. The best colections will be only for p2w people. 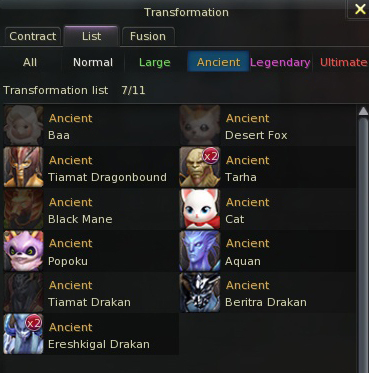 You can open the contracts now, because they won't contain new transformations in 6.5. As for fusion, better do that in the next patch.